perform the troubleshooting of dtc p0335 first. If no trouble is found, troubleshoot the engine mechanical systems. Read freeze frame data using the hand-held tester or the obd ii scan tool. Freeze frame data records the engine conditions when a malfunction is detected. When troubleshooting, it is useful for determining whether the vehicle was running or stopped, the engine was warmed up or not, the air–fuel ratio was lean or rich, etc. At the time of the malfunction. Read value of hand–held tester or obd ii scan tool (a) connect the hand–held tester or the obd ii scan tool to the dlc3. (B) start the engine and push the hand–held tester or the obd ii scan tool main switch on. (C) select the item ”diagnosis / enhanced obd ii / data list / all / engine spd”. The engine speed can be confirmed in data list using the hand–held tester or obd ii scan tool. If there is no ne signals from the crankshaft position sensor despite the engine revolving, the engine speed will be indicated as zero. If voltage output of the crankshaft position sensor is insufficient, the engine speed will be indicated as lower prm (than the actual rpm). Disconnect the c43crankshaft position sensor connector. 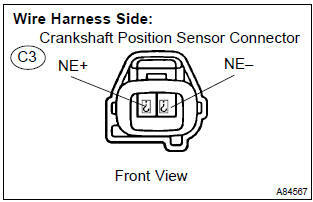 measure the resistance between the terminals of the crankshaft position sensor connector. : ”cold” and ”hot” shown above mean the temperature of the coils themselves. ”Cold” is from –10 c (14 f) to 50 c (122 f) and ”hot” is from 50 c (122 f) to 100 c (212 f). reconnect the crankshaft position sensor connector. Disconnect the c3 crankshaft position sensor connector. 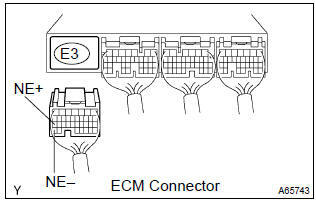 disconnect the e3 ecm connector. check the resistance between the wire harness side connectors. 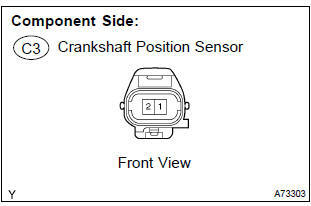 Check the crankshaft position sensor installation . Check the teeth of the sensor plate.